Meet my 9 year old daughter, Summer. This is how she feels about getting her hair brushed. As you can see, she doesn’t like it. At all. Hair brushing has always been a struggle. My daughter Summer just seems to have a very sensitive scalp so she hates the hairbrush. And grimaces and shrieks every time those bristles get anywhere near her head. As a result, we use a regular hairbrush with soft bristles that barely combs through her hair. And it’s not getting the job done. 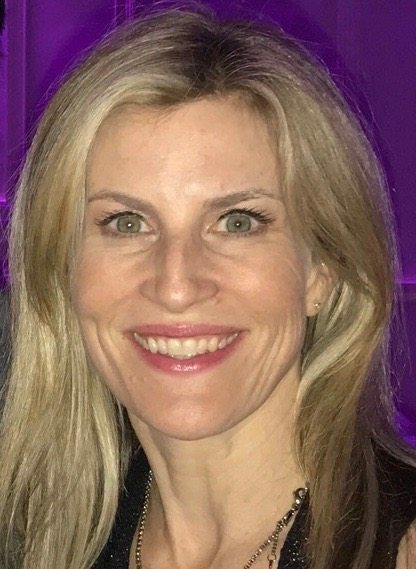 I know because we once once went to a salon for a haircut and the stylist said, “Your daughter is starting to get the beginning stages of dreadlocks at the base of her neck.” When a stylist mentions dreadlocks and your 9 year old daughter, it’s time for immediate action. I decided to review several of the most popular detangling hairbrushes and see which ones could get out the tangles with a minimal amount of scalp pain. And it turns out there is a big difference depending on the brand of hairbrush. A hairbrush is a very personal thing so you might want to try a few and see which ends up being your children’s fave. Our top picks are the Wet Brush-Pro Detangle and the Michel Mercier Detangling Hairbrush. Below we share why they are our faves and why you should skip the others that you may see for offered as a solution (spoiler: they’re not!). With the Michel Mercier Detangling Hairbrush, you have some options. They sell the brush for adults (normal, fine or thick hair) at a cost of about $12 to $14. They also sell a brush for kids (normal, fine or thick hair) for about $16. The hairbrush can be used on wet or dry hair but keep it mind, you are not supposed to use it with a hairdryer. And the company says this brush should be replaced every 8 to 12 months which seems a little crazy to me. Most people keep their brushes for years! Right?! We tried out the adult hairbrushes (for normal and thick hair) and the children’s brushes (for normal and thick hair). Interestingly enough, the adult brushes and the children brushes are EXACTLY the same except for the color and picture on the package. It seems like the only difference is marketing. I wanted to confirm this with the Michel Mercier company. I called their customer service number at their website and encountered a very angry sales representative. He insisted there was no children’s option even though it is clearly available on Amazon. I asked to speak to another sales representative and he hung up on me. I called back a few days later and spoke to a much nicer sales rep who confirmed that the adult and child versions are the same brush. So since the children’s brushes and the adult brushes are virtually identical, I would save yourself a few bucks and buy the adult version unless your child really likes one of the kid colors. My 11 year old did grab this brush right away for her own. Even though her hair is thick, she preferred the one for “normal hair.” She said it felt better on her head. My 9 year old (who definitely is the most sensitive) wouldn’t put up with it all. She was in tears pretty quickly. Strengths: Fun colors (pink, blue, green and some two tone colors for “kids”), definitely gets the knots out, could work for some children and adults. Weaknesses: Not supposed to use while blowdrying hair, company says it should be replaced every 8 to 12 months, did not love the thick, plastic feel of the handle, my kids reported moderate to significant scalp pain during brushing. 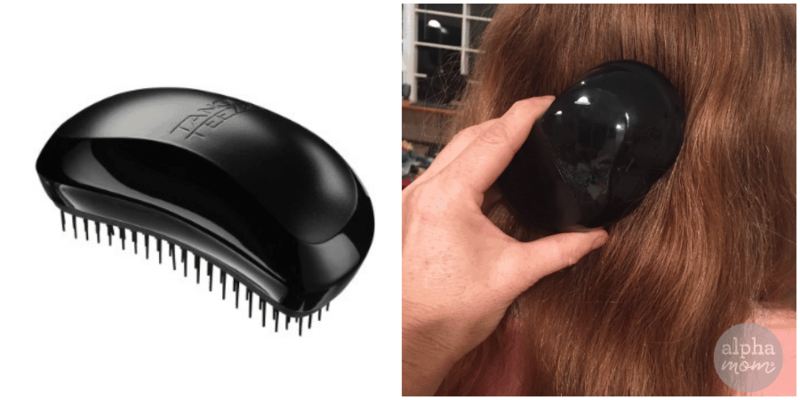 Final Word on the Michel Mercier Detangling Hairbrush: Some people rave about this brush on Amazon. But I didn’t think it was a miracle brush. Yes, it got the knots out. So if you have a kid that isn’t so sensitive but has fierce tangles, this could be a really good option for you. But if you have a child with a really sensitive scalp, definitely skip this and check out the Wet Brush-Pro Detangle hairbrush below. 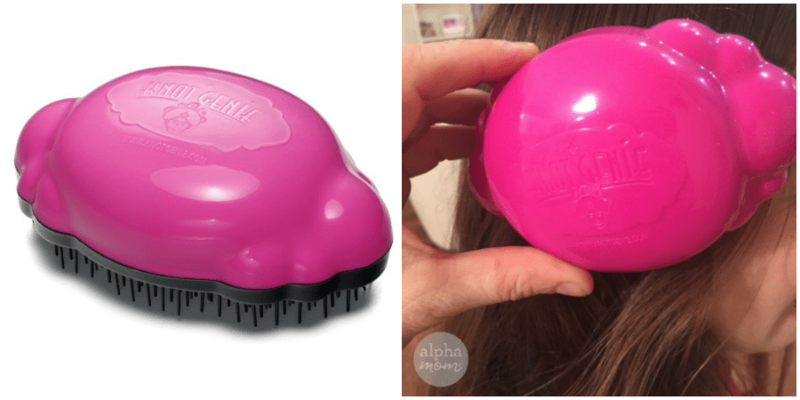 The Wet Brush-Pro Detangle hairbrush (about $9) is absolutely an Alpha Mom Favorite and our Top Pick. It has super soft bristles, works on wet or dry hair and can be used on thick, curly or straight hair. Good for hair extensions and wigs too. 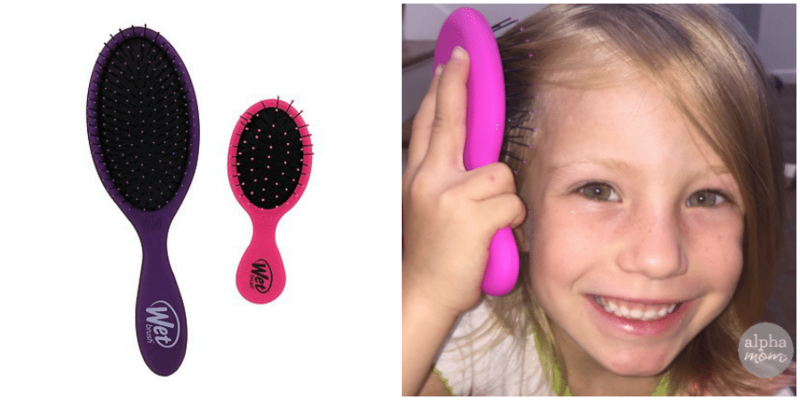 This hairbrush is a dream for my 9 year old daughter, Summer, with the super sensitive scalp. I can actually brush her hair without shrieking and tears. I also love the feel of this brush. It has a handle that is natural and easy to hold. I don’t think the Wet Brush Pro gets out knots as thoroughly as the Michel Mercier Detangling Hairbrush. But it does a pretty good job and without the stress and crying! Alpha Mom ordered the My Wet Brush Duo Combo ($15 on Amazon and pictured above) which comes with a little mini brush that my 6 year old loves. She has tiny hands and so many brushes are difficult for her to hold. This one is just perfect. Strengths: Gets out tangles without tears (for real), affordable, easy to hold, love the My Wet Brush Duo Combo because it comes with a small brush for little ones. Weaknesses: Won’t get out knots as aggressively as the Michel Mercier Detangling Hairbrush but much less pain and still gets the job done. Final Word on the Wet Brush-Pro Detangle brush: Alpha Mom favorite. 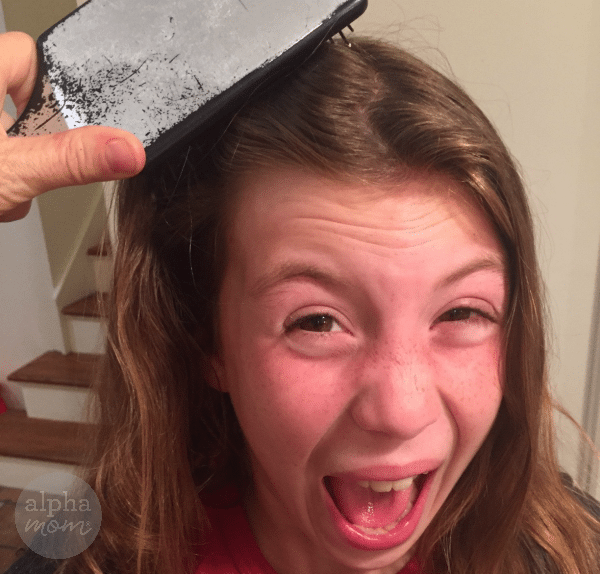 Brushing my 9 year old daughter’s hair has been a major stress for me (and her) over the years. I knew either the Dorothy Hamill haircut had to make a comeback or we needed to find the right brush. And this is it. I highly recommend this brush if you have a child or adult with a very sensitive scalp. This brush has a lot of positive reviews on Amazon and some people call it a miracle for their kid’s knotted hair. But I tried it out on all three of my girls (ages 6, 9 and 11) and none of them were too impressed. My 6 year old has fine, straight hair while my 9 and 11 year old have thick, somewhat wavy hair. My 9 year old who has the most sensitive scalp gave it a big thumbs down, saying it hurt. My 11 year old (who isn’t particularly sensitive) also said it caused some pain. As for me, I found the brush a little difficult to hold. It felt like I should be brushing a horse’s mane rather than my kids’ hair. I really prefer a brush that has more of a handle. Strengths: Affordable, seems like a savior for some people’s hair woes. Weaknesses: My daughters reported scalp pain while using it; hard to hold. Final Word on the Tangle Teezer: If your kid’s hair is turning into a bird’s nest, I’d try some other brushes available on the market first. The Knot Genie Detangling Brush sells for about $8 to $12 on Amazon. It comes in a bunch of cute colors… metallic pink, metallic purple, metallic blue, metallic silver, fairy pink, cloud blue, puff of purple, and camouflage. (The price varies depending on the color so keep that in mind when ordering.) Can use on wet or dry hair. The Knot Genie promises to slide through even the curliest, most knotted up, gnarly hair – gently, quickly and painlessly. The shape of the hairbrush is meant to be an extension of one’s hand. But they all thought it was weird to hold since it doesn’t have a handle. And for my 6 year old (who has small hands), it really was too awkward to hold. Strengths: Affordable, cool colors that kids will like, gets the knots out. Weaknesses: If you have a kid with a really sensitive scalp, this will probably still hurt. The hairbrush (which is supposed to be an extension of your hand) is a bit awkward to hold. Final Word on the Knot Genie Detangling Brush: Without doing research, I would probably be inclined to buy this product on the cute name and cool metallic colors. But this just wasn’t the brush for our family. Even though a couple of my daughters liked the feel of it, they still found the lack of a handle awkward. I would skip this one. 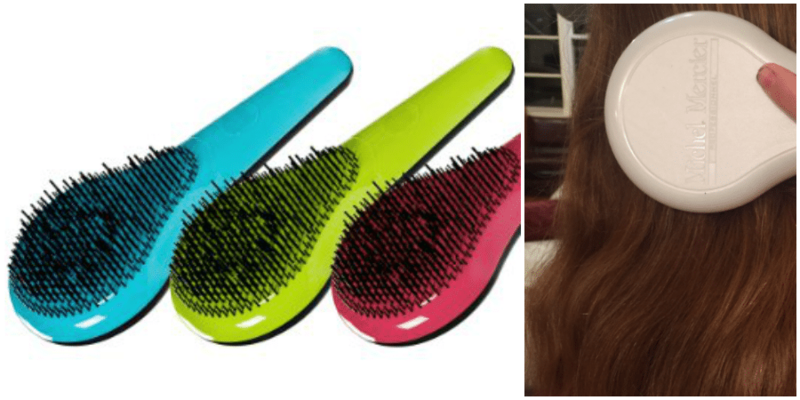 Which Detangling Hairbrush Should I Buy? The right hairbrush is a very personal decision and what works for one person, doesn’t always work for another. But if you have a kid with tangles, you need help ASAP. 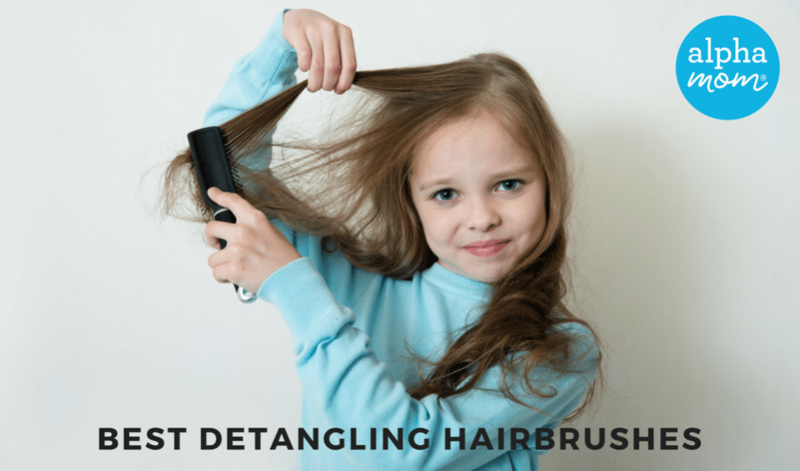 If your child can endure a bit of tugging and pulling, try out the Michel Mercier Detangling Hairbrush because it really does seem to detangle the hair although please note all the “weaknesses” of the brush above before purchasing. Because there are quite a few. If you have a child with a very sensitive scalp, absolutely buy the Wet Brush-Pro Detangle hairbrush. Like right now. I’ll wait. It’s that amazing. I can’t promise it will easily get out every single tangle but it does a really good job. And your kid won’t cry. I promise. If she or he does, I’ll come to your house and brush your kid’s hair every morning for you. And trust me, I don’t even want to brush my own kid’s hair. Until this review, my girls had been using a regular brush with very soft bristles. It didn’t hurt but it also didn’t really get the job done. All of the brushes reviewed here did a much better job of getting out the tangles than what we currently use at home. As always, if you have a hairbrush you just love or have feedback about the hairbrushes reviewed here, please share your experience! It takes a village to get our kids’ hair knot free. All hairbrushes reviewed here were purchased by Alpha Mom.